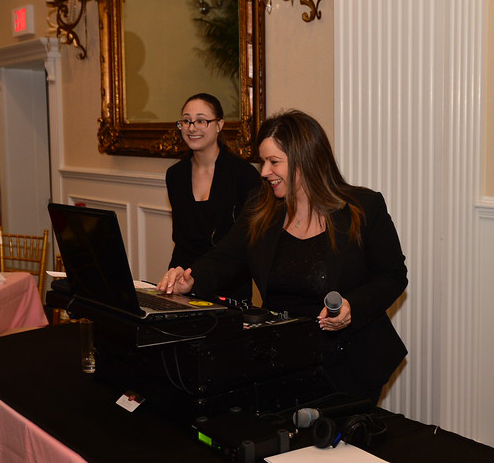 TFE had the pleasure of once again being the MC and DJ for this 3rd Annual Charity event, Thursday, May 7, 2015 at Buona Sera Palazzo, Ocean, NJ. Since 2013, the Monmouth County Chapter of Woman’s Council of Realtors has put together this zany, fun night to raise money for the American Cancer Society. Tara Feeley Entertainment has been involved all three years with this great group of woman who, all together, share the same belief of striving to give back to the community. Each year, as Master of Ceremonies, Tara Feeley has taken the stage with a terrific group of men, all who volunteer to wear a artfully designed bra in hopes of raising money as the models strut their stuff! Tara’s MC talent, comedic ability and her willingness to “go with the flow” as each male model takes the runway to skillfully selected music is what keeps WCR wanting her back each year! The craziness of the fun, yet professionally run event, helps WCR raise thousands of dollars for the American Cancer Society, and TFE is proud to be a part of such a great night for a great cause!